Professor Joy Damousi will be the facilitator of a panel discussion about the WWII and the Battle of Crete, at the Greek Centre, on Thursday 17 May 2018, with panelists the journalist Dena Gerolymou and the historians Dr Peter Ewer and Jim Claven. The panel discussion is part of the Greek History and Cutlure Seminars offered by the Greek Community of Melbourne and is organized with the collaboration of the Battle of Crete and Greece Commemorative Council. Personal stories can illuminate the past but the process is fraught with trauma and anxiety. To tell the story is to relive the past and narratives are, more often than not, punctuated by silences. In cases of war, where experiences are dominated by violence, loss, conflict and survival, the sharing of memories present many challenges for the person who tells the story and those who receive it. In many cases those who have lived through war and conflict prefer the security of silence as a means of dealing with the effects of war experiences. 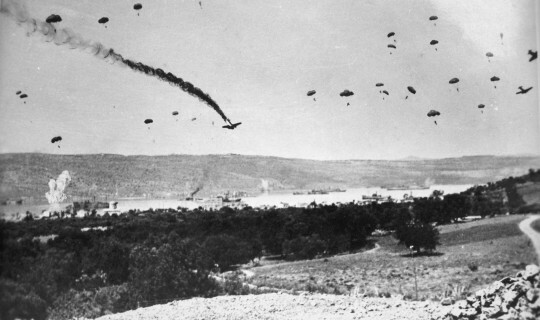 In the case of WW2, when Australians fought in mainland Greece and then Crete, the narrative includes a cultural dialogue that influenced post war migration to Australia and still continues. The panel will discuss the above issues as well as the challenges of creating a context for war memories, of reconstructing personal stories and bringing to light forgotten narratives of the Greek campaign of 1941, the Battle of Crete and the formation of the second ANZAC Corp.
Joy Damousi is a Professor of History and ARC Kathleen Fitzpatrick Laureate Fellow at the University of Melbourne. She has published widely on aspects of political history, women’s history and feminist history, memory and war, history of emotions, sound and war, and the history of migration and refugees. She is the author of numerous books which include The Labour of Loss: Mourning, Memory and Wartime Bereavement in Australia (Cambridge 1999); Freud in the Antipodes: A Cultural History of Psychoanalysis in Australia (University of New South Wales Press, 2005); Colonial Voices: A Cultural History of English in Australia 1840-1940 (Cambridge 2010) and Memory and Migration in the Shadow of War: Australia’s Greek Immigrants after World War II and the Greek Civil War, (Cambridge, 2015). She is currently working on a history of child refugees, humanitarianism and internationalism from 1920 to the present. With Philip Dwyer she is the general editor of a four volume Cambridge World History of Violence due to be published by Cambridge University Press in 2019. Dina Gerolymou is a journalist and the author of the book “The Battle of Crete: the untold stories” which stemmed from her investigative report on the lack of recognition for Australian World War 2 veterans who fought in Greece. She has postgraduate qualifications in history and has an interest in historical methodology, oral history and the documentation and preservation of Hellenic history in Australia. Dina is fascinated by personal stories and has interviewed a number of Greek-Australians who experienced WW 2, Australian veterans who took part in the Greek campaign in 1941 and their descendants. She is currently a senior producer with the Greek Program of SBS Radio. Dr Peter Ewer is an Australian historian and author. He has published in internationally renowned academic journals the Journal of Military History (University of Virginia), where he published a research article in 2011 on British planning for the campaign in Greece which shed new light on the ANZAC contribution to the defence of the country. He is the author of Forgotten Anzacs: the campaign in Greece, 1941, published in 2008. Scottish-born Jim Claven is a trained historian, holding both Bachelor and Masters Degrees from Melbourne’s Monash University. A former adviser on Veteran’s Affairs and Tourism, Jim is a freelance writer and published author. He has been researching the Anzac trail in Greece across both World Wars since 2011, with a particular focus on the Island of Lemnos and its link to the Gallipoli campaign and Australia’s Anzac story. We'd like to thank the following sponsor: Battle of Crete and Greece Commemorative Council.